Today, I have completed diode and resistor modification of the LEDs and replaced 4 rear tail/brake lights with these LEDs. They have worked quite fine, no problem, and the brightness of them were better than regular bulbs. Especially the red color of them fit perfectly. And also I checked the cruise control, it is functioning perfectly, no problem. Here is my conclusion about the led and its effects on the cruise control system. As I have read many threads about this issue, many people have had problems and some of them given up using them. During my study and tests on this issue, I have found that the problem is the leaking positive voltage of the tail light to the brake light end through built in resistors which causes the cruise control to disengage or never engage. 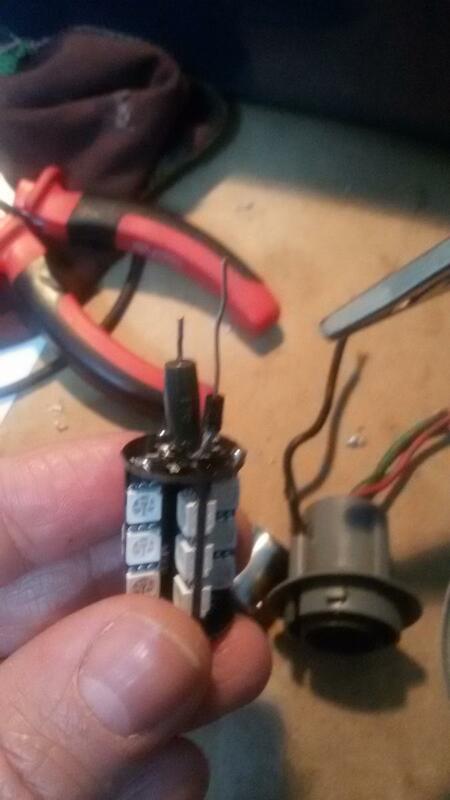 As a solution I have added a 1N4001 diode to the brake light end for each bulb to prevent this voltage leakeage. And another problem was the heat built up which toasts the built in resistor. I have replaced the built in 47ohm 1/4 watt resistor with a 47 ohm 3W one on the tail light end. I have done the modification inside the bulb case, and tested the heat built up. The picture of the modification and the maximum temperatures that I measured are given below. As a recommendation I have to say; if you are not familiar with electronics dont try to do this by yourself, instead you may find proper led bulbs which have built in diodes. When to buy a led bulb, grab a multimeter and measure the resistances between the contacts to understand the existence of diodes. If the reading between tail and brake positive ends (at the bottom of the bulb) is O.L it will mean that there is a diode between them which will prevent voltage leakage. If you have a look at the temp table, the temp of LED (modified) is almost less than a regular bulb. The temp at the lead is slightly higher at tail light mode, but lower than brake light mode (48<61<91 in C) or (118<142<196). I would prefer to use a 5W resistor for less heat up, but I could not find a small size for the bulb case, I am sure this one will be safe as well. And if you will add the diode on the brake cable instead of inside of bulb case; use a higher amperage diode for safety, thinking someone else later may try to use a regular bulb which will draw higher current. Very good write up, and well explained as to the "why it don't work" and the fix. Don't remember I ever heard of that problem but just in case you have the solution. I would have thought an LED being a diode it would take care of that on it's own. The problem is at the connections. 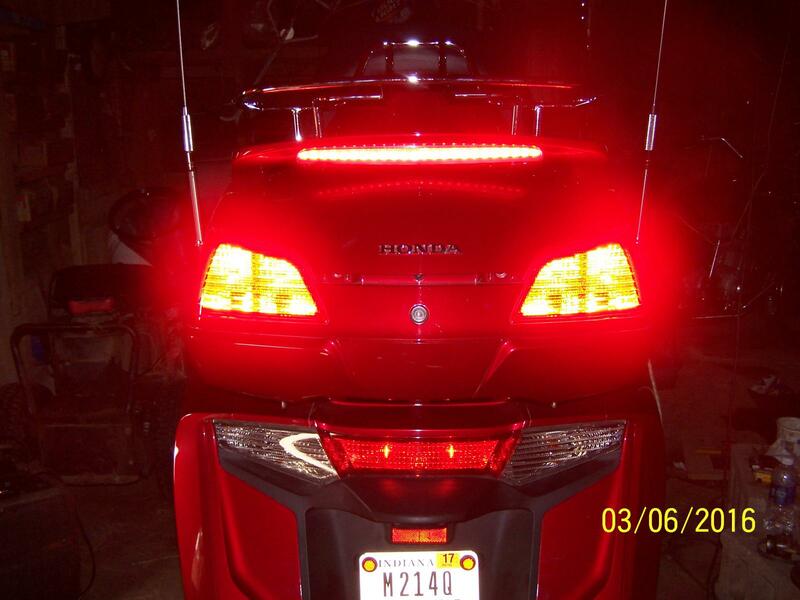 For two contact LEDs most of the manufacturers use a resistor to dim the light on tail light mode while in a regular bulb two different filaments are used. For that reason if we don't use a diode at the brake light end some of the positive voltage (here 7-8v) is found at the brake light end as if we apply brake. Last edited by Erdeniz Umman; 02-15-2016 at 04:48 PM. The problem is at the connections. For two contact LEDs most of the the manufacturers use a resistor to dim the light on tail light mode while in a regular bulb two different filaments are used. I see, I have not messed with any LED bulbs. 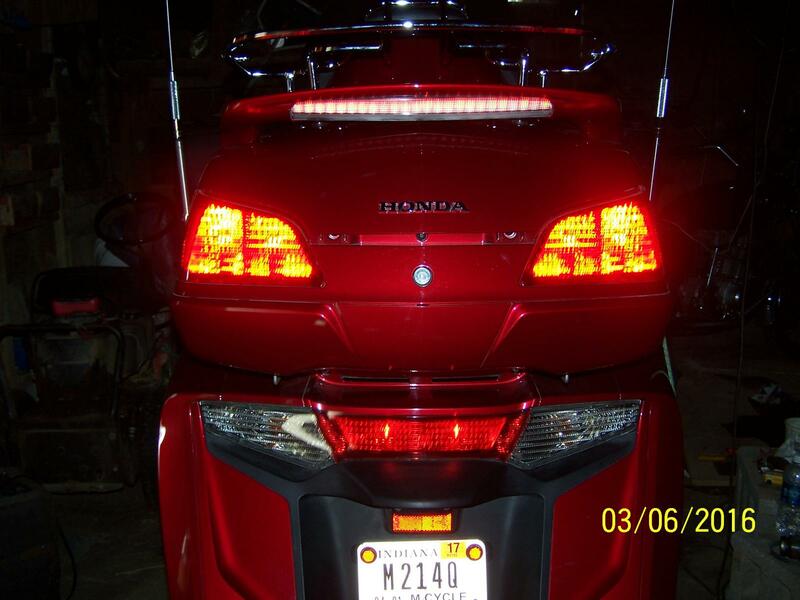 I knew tail lights for trailers etc. used that kind of set up. I tried these and got 6 bulbs for $36 because i asked what the price would be for 3pr. Not cheap but they are brighter than OEM on running lights and brake lights. OEM are bright enough in my opinion but these still keep a good brightness differential between running and brake. I greatly reduced current draw, especially when brakes are on. Bulbs have 4 contacts and are polarity sensitive.. If they don't work right turn them around. First pic is LEFT replaced with LED and RUNNING lights ON. 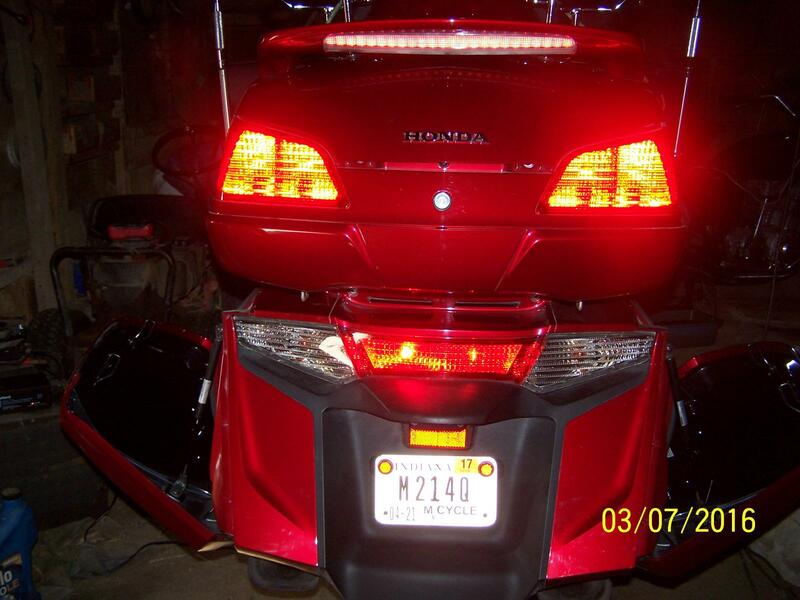 Second is BRAKE lights ON and LED on left - OEM on RIGHT. 4th is BRAKE on SPOILER and TOP TRUNK LED-lower is OEM and just running light. Camera on 3rd pic didn't show the LED as bright as it should have been but does show the difference between LED on top and OEM on bottom. Just for the record, I'm still using these 1157 LEDs on a '97 GL1500 SE, with no ill effects on the cruise system. 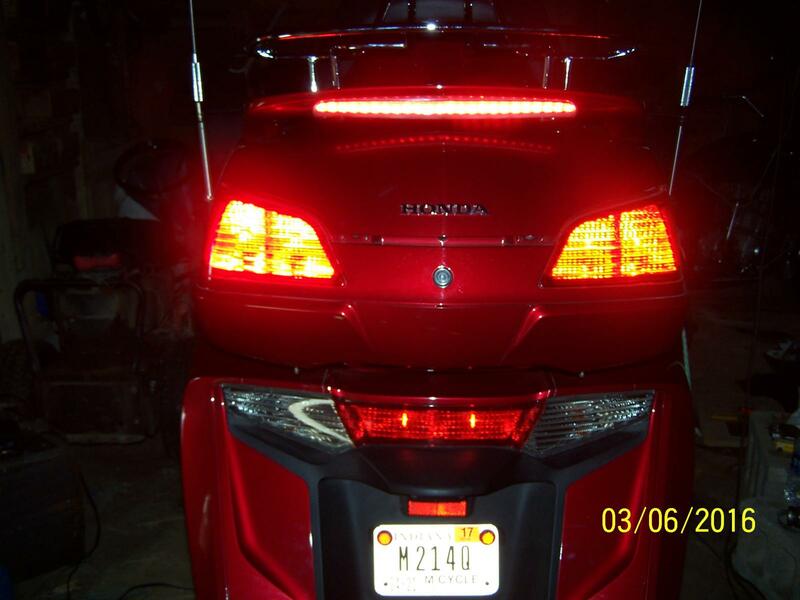 I was unaware that there was even an issue with LED tail/brake lights, regarding the cruise system. They are equally as bright as the OEM incandescent bulbs. No brighter, no dimmer. But they certainly do 'trigger' faster, thus a more distinct flash rate when turned on or off. One thought did just occur to me while writing this. I have a Back-Off brake flasher in the system, between the brake lights and the incoming signal. So, the braking system of the bike doesn't really 'see' the LEDs. It sees the Back-Off modulator. I wonder if that could explain why I have had no issues with the cruise system. The Back-Off was installed before I ever went to LEDs on the rear end. Just a thought. Personally, I wouldn't be without the Back-Off brake modulator. It gets a lot of attention on braking. That might be a simpler solution to the discussed LED / Cruise issue. Just install a Back-Off, and your LEDs are good to go ? These are the times that try men's souls. The summer soldier and the sunshine patriot will, in this crisis, shrink from the service of their country; but he that stands by it now, deserves the love and thanks of man and woman. Tyranny, like hell, is not easily conquered; yet we have this consolation with us, that the harder the conflict, the more glorious the triumph. 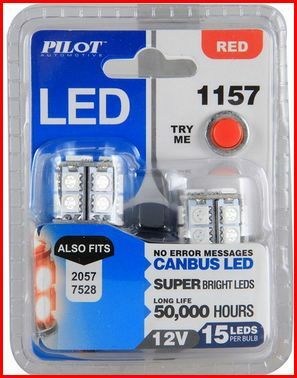 I have been using 1157 LED tail/brake bulbs for about 5 years now with no ill effects to my cruise control operation. What Bluewaterhooker said about the Back-off flasher unit got me to wondering about whether that was why I hadn't seen any difference in the cruise control. 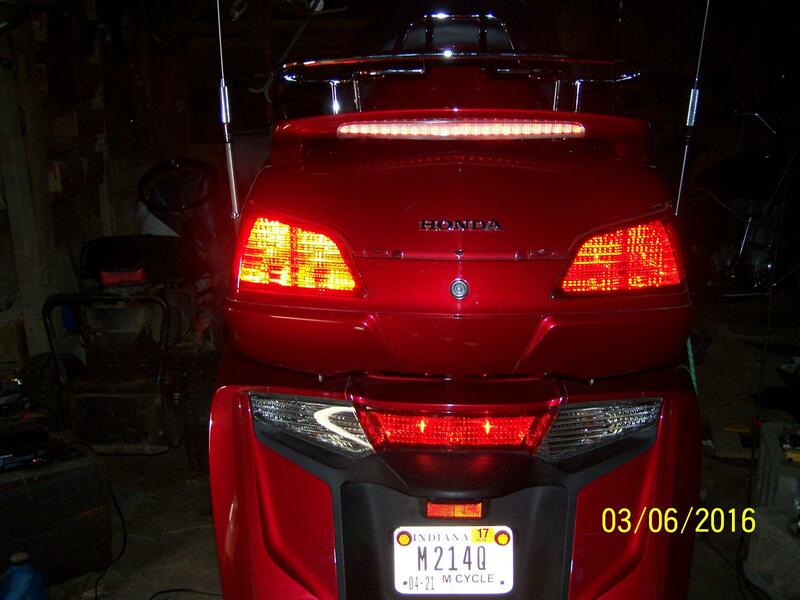 I went back and looked up when I installed the Back-off flasher on mine and it was a little over a year after I had put in the LED tail/brake lights, so that did not have anything to do with mine working or not. I got my 1157 LEDs from superbrightleds.com. They are the tower type bulbs that have the LEDs all around the surface of the bulb. OR can I grab the one currently on the Shadow that was wired in and re-use it. lots of running light and more brake lights. I would reuse the one you have.